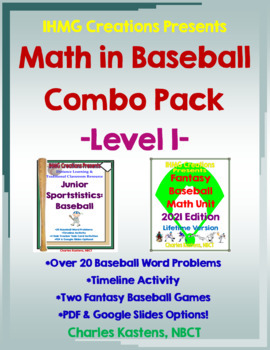 Math in Baseball-Level I: Word Problems & Fantasy Baseball Combo-Lifetime Ed. Baseball has been in America since the 18th century...and is full of math!!!!! 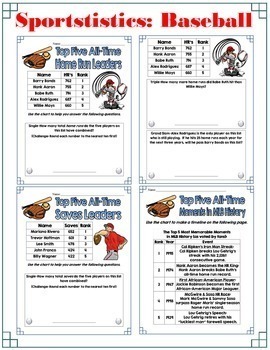 This product has two resources that allow students to engage in a variety of math skills, while learning about some of the greatest players in baseball history! First, in "Sportstistics: Baseball-Level I," students examine eight different ways that math is embedded into baseball, including home runs, stolen bases, wins, and strikeouts. Each of the eight categories contains three questions (addition, subtraction, and a multiplication/multi-step/graph/writing/or higher level thinking question). 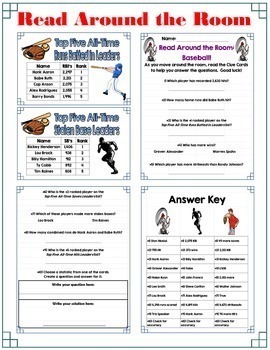 There is also a timeline activity and three different "Read Around the Room: Baseball" activities, that combine reading, writing, and math skills. It is a great way to get kids out of their seats, reading and doing math! 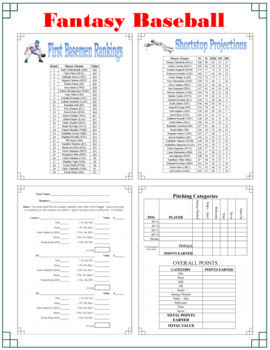 In "Fantasy Baseball Math Unit: 2019 Edition," In this students use a variety of math and problem solving skills and strategies to build a fantasy baseball roster, using a pretend $250 budget. They then use statistics to compete against each other's rosters to see who is the top "General Manager" in the class! These resources could be used to enrich a math curriculum, as a math center, or in a small group or teamwork setting, and meets many Common Core Math Standards in grades 3-5. However you choose to use them, I am sure your students will enjoy it and you will see the positive results! Thank you for checking out this product!